The first habitation in the area of Palaiochora (Amnissos) dates from the Middle Minoan period (19th century B.C.). The site is mentioned as a-mi-mi-so in the Linear B tablets. The Minoan Villa of the Lilies was destroyed by fire in the 15th century B.C. but complexes C and E continued to be inhabited until the 12th century B.C. In the Archaic period (7th century B.C.) the sanctuary of Zeus Thenatas was founded and remained in use until the 2nd century A.D. After a long period of abandonment, the hill was again inhabited during the Venetian occupation. The first excavations of the site were conducted at the villa by Spyridon Marinatos in 1929-1938 who also excavated Akrotiri in Santorini. 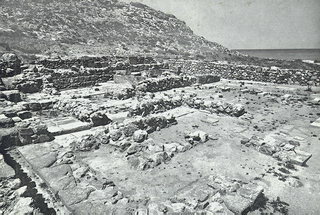 Parts of the Mycenaean settlement (LM III period) were later excavated by Stylianos Alexiou. In 1983-85 the buildings were cleared and drawn by the Archaeological Institute of the University of Heidelberg, under the direction of Jorg Schaefer. Consolidation works and clearing are carried out at intervals by the 23rd Ephorate at the Villa of the Lilies and the sanctuary of Zeus.